A Storm Over the Pavé! I'm recovering from the Olympic hockey euphoria that hit Vancouver like a Belgian Classic storm. That was one of the great hockey games that I've ever seen in a long time. You can bet I'm wearing my maple leaf pin with pride. Yesterday's Belgian storm hit big time over at Kuunre-Bruxelles-Kuunre and the surviving riders look like a war torn bunch. 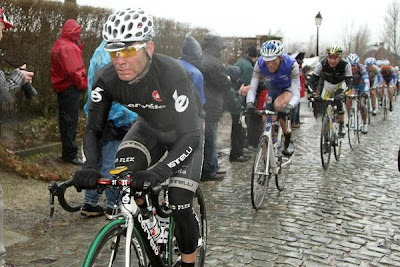 For a semi classic, KBK resembled a better fight of rider vs the elements than Saturday's relatively dry Omloop. The messier it is the better. 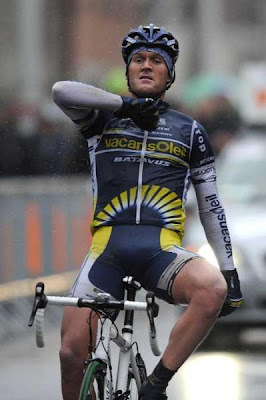 Good win for Dutch domestique, Bobbie Traksel. And hard work goes rewarded to Rick Flens (second) & Ian Stannard (third). It goes to show you a supporting rider can also win a big race. Most of the favorites dropped off or just dropped out of the race. The brave ones were left to contend with the harsh weather but three non-Belgian's found themselves finishing in the top three spots. Thor Hushovd (6th) looked strong and with the help from teammate Dominique Rollin (5th) rode intensely like the weather to the finish. I'm believing in Rollin and he looks very close to a big classic win. Just keep the cold and rain coming! A typically miserable classic day for all!